For added security, you can set up your Pexip Infinity Virtual Meeting Rooms (including scheduled conferences) and Virtual Auditoriums with PIN numbers. You can use the same PIN for all participants, or you can use PINs to differentiate between Hosts and Guests. In the Host PIN field, enter the PIN number to be used. In the Allow Guests drop-down list, select No. PINs must use the digits 0-9 only. PINs may optionally end with #. PINs must be between 4–20 digits long, including any #. You can set up your Virtual Meeting Rooms and Virtual Auditoriums so that they are "Hosted". Hosted conferences have two different types of participants: Hosts and Guests. Hosts and Guests both dial the same alias to join the conference. both Hosts and Guests must enter a PIN. Only those participants who enter the Host PIN have privileges to control the conference; everyone else is a Guest and can only participate in the conference. An administrator can configure individual Virtual Meeting Rooms and Virtual Auditoriums so that Guest participants are not allowed to present into the conference (they can still receive presentation content from other Host participants). By default, Guests are allowed to present content. If a conference is locked, Hosts can still join, but Guests are held at a waiting screen. For conferences that use Virtual Auditoriums, the administrator can select different layouts for the Host view and Guest view. For more information, see Selecting the layout seen by participants. If any Guests join the conference before a Host has arrived, or while the conference is locked, they are shown a holding image and hear a message advising them that they are waiting for the conference Host. The message is repeated every 30 seconds for video participants, and every 15 seconds for audio-only participants. Such participants will be disconnected automatically after 15 minutes waiting, but Administrators can change this time - see Limiting how long Guests can wait for a Host. A minute or so after the last Host has left, any remaining Guests are automatically disconnected. Administrators can change the length of time before Guests are disconnected by going to Platform configuration > Global settings > Guests-only timeout. During the conference, Guests are only able to see the Hosts; they cannot see other Guests. However, after the last Host has left, Guests can see any other remaining Guests during the disconnection timeout period. Guest participants will not be shown the streaming indicator and so will not be aware if the conference is being streamed or recorded. Guests cannot join a conference until the first Host has joined. 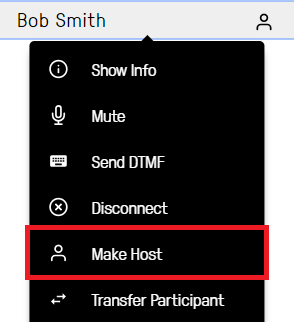 However, if the Host joins as a presentation and control-only participant via an Infinity Connect client, that Host has to start the conference manually to allow Guests to join. If the first participant to join the conference is a Host, that Host is shown a holding image until another Host or Guest joins the conference. If the conference has a Host PIN, participants who enter the Host PIN can join the conference even if it is locked. The presence of a Host in a conference may prevent that conference from being automatically terminated. send DTMF tones to other participants in the conference. The Pexip Infinity administrator may configure the Virtual Auditorium so that Hosts see other participants in a different layout to that seen by Guests. For more information, see Selecting the layout seen by participants. In the Host PIN field, enter the PIN number to be used by the Hosts. In the Allow Guests drop-down list, select Yes. If you want to require Guests to enter a PIN, in the Guest PIN field, enter the PIN number to be used. If you leave this field blank, anyone who dials the alias of the Virtual Meeting Room or Virtual Auditorium will be able to access the conference as a Guest. However, the conference will not start until the first Host has joined and in the meantime all Guests will continue to be shown the holding screen. Host PINs and Guest PINs must be different. If the Host PIN ends in # and a Guest PIN is used, the Guest PIN must also end with #. If # is not used, Host PINs and Guest PINs must have the same number of digits. You cannot configure a Guest PIN unless you have already configured a Host PIN. Participants who enter the PIN have Host privileges. The conference will not begin until they have joined, and will finish a minute or so after the last Host leaves. All other participants have Guest privileges and do not need to enter a PIN. They will see a holding screen until the first Host joins. Participants who enter the Host PIN have Host privileges. The conference will not begin until they have joined, and will finish a minute or so after the last Host leaves. Participants who enter the Guest PIN have Guest privileges and will see a holding screen until the first Host joins. * If you configure a Guest PIN, you must also configure a Host PIN. Participants (other than Infinity Connect clients, and connections via the client API) have three attempts to enter a correct PIN. After the third unsuccessful attempt, they will hear a message advising them that the PIN is invalid, and their call will be disconnected. Further protection against PIN cracking attempts can be achieved using the Break-in resistance settings, which apply to all clients. All PIN entry attempts, successful and unsuccessful, are logged in the administrator log. Adds extra security by disguising the length of the PIN. This is because when a PIN does not end in a #, users (except those using Infinity Connect clients) will be presented with the "Invalid PIN" message after entering the same number of digits as that of the PIN. Allows administrators to set different length PINs for Hosts and Guests. Allows users who have accidentally entered too many or too few digits (particularly those using audio-only, who have no on-screen indication of the number of digits required) to return to the start of the PIN entry process by entering #. You cannot configure a Host PIN that ends with # and a Guest PIN that does not (or vice versa). For conferences where a terminal # is used, Pexip Infinity automatically uses the appropriate audio file, asking participants to "please enter the conference PIN number followed by the pound key". Preconfigured themes allow you to change the use of "pound key" to "hash key". For Infinity Connect clients, the terminal # is optional when entering a PIN. in the Guest PIN field enter 567890#. Now when anyone calls the VMR they will hear the message "please enter the conference PIN number followed by the pound key". leave the Guest PIN field blank. Now when anyone calls the VMR they will hear the message "please enter the conference PIN number". Infinity Connect users who have a role of Host can change the role of other participants in the conference. This is useful, for example, if a Host needs to leave the conference; they can promote one of the Guests to a role of Host so that the conference will continue after they disconnect. Participants who have joined via a Skype for Business / Lync meeting will have a role of External; their status cannot be changed. You cannot change your own role to Guest. SIP and H.323 endpoints and Skype for Business / Lync clients that dial into PIN-protected conferences can bypass the PIN entry screen by including the PIN in the dialed alias. This makes it more convenient, for example, when bookmarking PIN-protected conferences. They can do this by including the relevant PIN (either the Host PIN or the Guest PIN as appropriate) in their dial string when dialing the Virtual Meeting Room or Virtual Auditorium. The dial string should be in the format: <vmr_alias>**<PIN>@<domain>. For example, if the alias of the Virtual Meeting Room is meet.alice@example.com and the PIN is 1234, then the endpoint can dial meet.alice**1234@example.com to go straight into the VMR. Note that H.323 devices can also use the dial format <vmr_alias>#<PIN>@<domain>. If there is a # configured at the end of the PIN e.g. 1234#, then that # is not required in the dial string. By default, participants have two minutes to enter a correct PIN before the system disconnects them. The timer starts when the participant gets to the PIN entry screen, and participants will be disconnected at the end of the specified time, whether or not they have entered any PINs during that time (in other words, the timer does not restart after each PIN entry). You can change the length of time by going to Platform configuration > Global settings > Service configuration and changing the PIN entry timeout. Note that this limit does not apply to participants using Infinity Connect clients, or to connections via the client API, because they enter PINs via a different process. allow the Guest to join a locked conference, either by unlocking the conference or permitting the individual participant to join. This time applies per-participant, so if Guest A joins a conference five minutes before Guest B and a Host does not join, Guest A will be disconnected five minutes before Guest B. You can change this length of time by going to time by going to Platform configuration > Global settings > Service configuration and changing the Waiting for Host timeout.